This came up recently on a blog and I think I dreamed about it all night…. 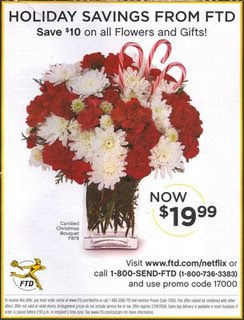 Guy sees flyer above from FTD, thinks of his wife, orders flowers, and gets the picture to the left. My pet peeve is misrepresentation. I am soooo hacked off when something I believe in and have an expectation of is misrepresented. Back in the day, FTD was synonymous with florist. Those days are long gone. This is only exhibit A. I could go to exhibit Z with examples of this nature from the box shipping floral industry. Remember there is a difference between FTD and FTD.com. FTD.com (or should it be FTD.con?) is in competition with the very florists they are supposed to represent. The short lesson? Trust your LOCAL florist! 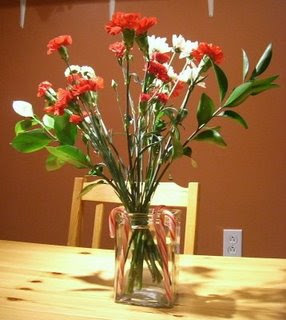 And I feel so sorry for the guy who just wanted a nice arrangement for his wife. His expectations were not unreasonable. What he got for it certainly was. As a floral designer, this kind of disappointment for a consumer just makes me mad. And sad. Why can’t we be authentic and sincere? Why can’t we be transparent and honest? Why can we not give an accurate representation of what we SAY we believe in? WHATEVER you do, keep it real. Keep in honest and authentic. Do not misrepresent what you are selling. EVER. Underpromise and overdeliver. If you are selling real estate, potatoes, cosmetics, dog food, or even (especially!) a belief system, just be fair and honest and reasonable.